Folded Strata of Cuesta Carlota, Ernst Canyon (June, 1992) The multilayered strata of the Boquillas Formation have been lifted into the ridge of Cuesta Carlota trending north and south. 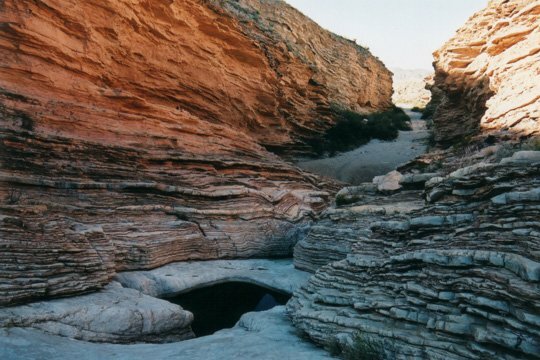 The gnarled forms of the strata are well exposed in the canyon near Ernst Tinaja. The old War Trail will carry you through Persimmon Gap, a pass in the Santiago Mountains. The remains of marine animals—sponges, trilobites and brachiopods—are part of the stew that hardened into the mountain’s rock. A mighty river flows south of here, but, at the northern boundary of the park, there’s no water in sight. Three to five hundred million years ago, however, this region was covered by a large inland sea that stretched into Oklahoma and Arkansas. Sediments from the northern edges of this sea form the first layer in Big Bend’s geologic history. Around 300 million years ago, the South American continent, riding on a tectonic plate, collided with the North American continent. Geologists call it a collision, even though the speeds of the plates are measured in millimeters per year. As South America continued to shove up against its northern neighbor, land bunched up to form the Ouashita Mountains in Oklahoma, Arkansas and Texas. At one time these mountains would have rivaled today’s Rockies or the European Alps. Over the past 300 million years, the Quashitas have eroded down to mere stumps. Although they lie outside of Big Bend, their creation is captured in the wrinkled rock layers inside the park. As you head south along the desert floor to Big Bend’s headquarters in Panther Junction, you’ll pass the Santiago and Rosillos Mountains. It’s a 29-mile trip. The contrast between the desert floor and the majestic mountains that rise up into cooler and moister air can be phenomenal. At the right time of day, the sun casts purple, orange or yellow light on the mountainsides, further distancing them from the sharp, blistered world below. You’ll cross a dry creek bed. During the rainy months, a shallow trickle may wind its way along this path. On other days, the creek is dry, like the crust on a fully baked pie. Still, the thought of the river south of here is reassuring. The Chisos, Santiago and Sierra del Carmen Mountains rose up as the Rocky Mountains to the north and the Sierra Madre in Mexico made their debuts. It was about this time that an asteroid struck Earth and perhaps contributed to the extinction of the dinosaurs. From Panther Junction, you can head west, then south, skirting the Chisos mountains, which lie at the heart of the park. Continuing south on the Ross Maxwell Scenic Drive, you pass abandoned ranches. You see Mule Ears Peaks, a pair of pointy mountains that resemble the ears of a mule. And you see piles of white volcanic ash called tuff—evidence of a more volcanically active past for Big Bend, millions of years ago. 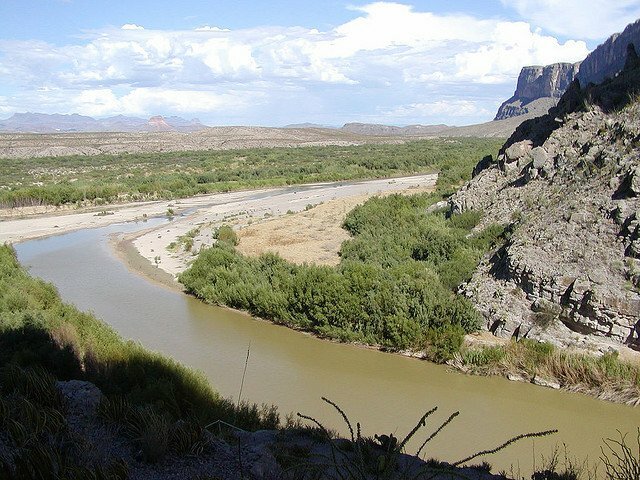 You finally reach the Rio Grande River at Santa Elena Canyon. In Spanish, “grande” means “big,” but here the river seems to belie its name. It flows slowly, and it’s shallow enough to wade across. Still, long ago, this river carved a canyon 1,500 feet deep through the Sierra de Santa Elena mountains.